Rice pudding isn't just for kids! This grown-up version gets a brilliant crust of caramelised sugar to add an extra texture to an otherwise creamy and unctuous pudding. 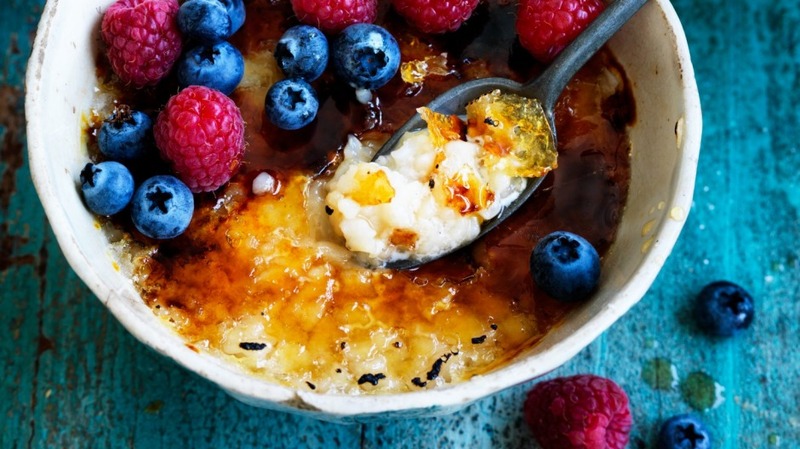 A caramelised sugar topping takes rice pudding from creamy to dreamy. 1. Place the rice, almond milk, water and salt in a medium saucepan on a medium heat. Bring to a simmer, then stir over a low heat for 45 minutes, stirring all the time and keeping a watchful eye over it. 2. Divide the rice pudding between four heat-resistant bowls or ramekins. Sprinkle the tops with the sugar. 3. Grab your blowtorch, or if you don't have one a blowtorch turn your grill to its hottest setting. Torch the top of the rice pudding until golden or place the ramekins on a baking tray and place under the preheated grill to caramelise. 4. Top with berries and serve.